Barracuda Web Application Firewall gives your DevOps and application security teams comprehensive security that is easy to deploy and manage. Physical, virtual, and in the cloud-Barracuda Web Application Firewall eliminates application vulnerabilities and protects your web applications against application DDoS, SQL Injection, Cross-Site Scripting, and other advanced attacks. The Barracuda Web Application Firewall provides superior protection against data loss, application-layer DDoS, and known and previously unknown zero-day application-layer attacks. As new types of threats emerge, the Barracuda Web Application Firewall dynamically acquires new capabilities to block them. These definitions are automatically updated and will “virtually patch” your applications, ensuring the highest security posture at all times. This greatly reduces the time between vulnerability disclosure and vulnerability patching. 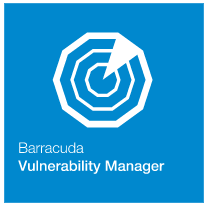 Barracuda Vulnerability Remediation Service generates a report that can be used to automatically configure the Barracuda Web Application Firewall. You can then automate vulnerability scanning to maintain your security posture as your web presence evolves. The Barracuda Web Application Firewall gives you strong granular controls to easily restrict access to sensitive applications or data to authorized users. 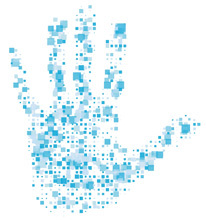 Integrated Identity Access and Management pre-authenticates on the perimeter allowing access. 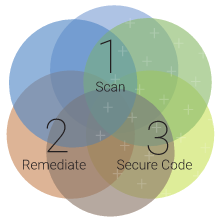 You can offload User Access Control from multiple applications to a single consolidated device. 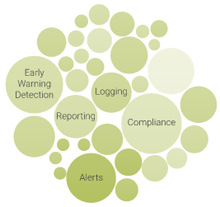 Detailed audit logging provides clear visibility into user activity across all protected applications. Barracuda Web Application Firewall is designed to be easy and fast to deploy, configure, and manage. Integrations with best-of-breed security tools ensure easy deployments into existing environments while providing granular logging, alerting, and reporting for management, compliance, or early warning detection. It can be deployed in High Availability clusters to ensure maximum application uptime thanks to redundancy and seamless failover capabilities. Today, cloud computing has become a “must-have” to a majority of the enterprise IT community, for reasons ranging from economic gains to technology benefits. But one of the major concerns carrying over from traditional IT-data and application security-has not changed, and requires the same diligence in the cloud as with on-premises solutions. Fortunately, the Barracuda Web Application Firewall can be readily plugged into private cloud environments as well as third-party cloud platforms like Microsoft Windows Azure or Amazon Web Services. Why Barracuda Web Application Firewall? When selecting security technology, it is critical that your products are supported by people who take your data security as seriously as you do. 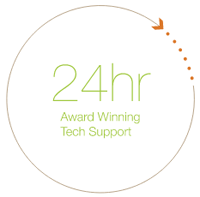 The Barracuda Web Application Firewall is supported by our award-winning 24x7 technical support staffed by in-house security engineers with no phone trees. Help is always a phone call away. Hundreds of thousands of organizations around the globe rely on Barracuda to protect their applications, networks, and data. The Barracuda Web Application Firewall is part of a comprehensive line of data protection, network firewall, and security products and services designed for organizations seeking robust yet affordable protection from ever-increasing cyber threats. Barracuda Web Application Firewalls protect networks against unauthorized access, data leakage, site defacement and other malicious attacks by hackers that compromise both the privacy and integrity of vital data. By installing a Barracuda Web Application Firewall, businesses that store, process and/or transmit credit card numbers can protect their Web applications and achieve PCI DSS compliance in one easy step. In response to the increase in identity theft and security breaches, major credit card companies collaborated to create the Payment Card Industry Data Security Standard (PCI DSS). PCI DSS provides a baseline of technical and operational requirements designed to protect cardholder data. It applies to all entities involved in payment card processing - including merchants, processors, acquirers, issuers and service providers, as well as all other entities that store, process or transmit cardholder account data. The 12 PCI DSS requirements are organized into six main categories that prevent credit card fraud through increased controls around data and its exposure to compromise. To be fully compliant, an organization must satisfy all 12 requirements. Merchants and organizations should be most concerned with PCI DSS Section 6, which addresses the development and maintenance of secure systems and applications. PCI-DSS compliance requires organizations either submit to code audits or install a Web Application Firewall to secure their public facing Web applications. A code audit places considerable strain on a company with a large quantity of code that needs to be reviewed. This results in a considerable amount of time and cost for each application. Furthermore, code audit provides a point in time protection; quarterly reviews must be maintained to account for any change in the application code. This burdens organizations by constraining their engineering teams to fixing vulnerabilities rather than continuing to innovate and drive companies forward in the marketplace. 6.5.1 Injection Flaws Injection flaws are prevalent in Web applications and are often found in SQL queries, LDAP queries, OS commands, and program arguments. Inspects each client request to the Web application servers for malicious code and blocks any malicious request. 6.5.2 Buffer Overflow Overloads memory capacity to execute a malicious program to steal passwords, alter system configuration, install backdoors or launch other attacks. Rejects malformed requests to Web servers and limits total Web form request length. 6.5.3 Insecure Cryptographic Storage Exploits applications that fail to store sensitive information such as credit card numbers as encrypted fields. Filters and intercepts outbound traffic to prevent the transmission of sensitive information. 6.5.4 Insecure Communications Failure by applications to encrypt network traffic containing sensitive communications. Provides Instant SSL functionality that transforms an HTTP Web site into an encrypted HTTPS site without having to change any code. 6.5.5 Improper Error Handling Exploits error messages to gather information about the OS and server versions, patch levels, etc. to launch targeted attacks on the server with known platform vulnerabilities. Cloaks details of the Web application infrastructure and blocks a server's error messages from being sent out to the client. Filters and intercepts outbound traffic to prevent the transmission of sensitive information. All "high" vulnerabilities discovered in the vulnerability identification process. Protects against all of the top threats. Reverse proxy deployment is architecturally superior and more secure than sniffer or bridge solutions. 6.5.7 Cross Site Scripting (XSS) Injects malicious code from a trusted source to execute scripts in the victim's browser that can hijack user sessions, deface Web sites, or redirect the user to malicious sites. Validates user input by terminating session and inspecting incoming requests before forwarding it to the backend servers, blocking it prior to executing within a browser. 6.5.8 Improper Access Control No credential checks. Failure to restrict URL access, directory traversal. Provides a granular URL and form-level rules engine that restricts access to unauthorized resources. Sets up and enforces authentication & authorization policies via integrated LDAP, RADIUS, CA SiteMinder and RSA SecurID. 6.5.9 Cross Site Request Forgery (CSRF) Hijacks a browser from a logged in victim to send forged requests without the victim's knowledge. Injects randomized tokens into online forms to authenticate data streams, eliminating unauthorized or malicious requests. With over a decade of experience in securing Web applications, the Barracuda Web Application Firewall is the proven solution used by organizations of all sizes to secure their valuable assets against Web threats. The Barracuda Web Application Firewall blocks an ever-expanding list of sophisticated web-based intrusions and attacks that target the applications hosted on web servers. Below are the hardware specifications for the Web Application Firewall. 1 Fiber NIC and Ethernet hard bypass options available. The Barracuda Web Application Firewall integrates security, scalability and application acceleration into a next generation Application Delivery Controller (ADC) platform for highly secure and scalable web applications. Its application-layer firewall protects web applications against existing and emerging Layer 7 threats such as Cross Site Scripting (XSS), SQL injections (SQLi) and Cross Site Request Forgery (CSRF). The integrated access control engine enables administrators to create granular access control policies for Authentication Authorization & Accounting (AAA) without having to change the application. The onboard L4/L7 Load Balancing capabilities enable organizations to quickly add backend servers to scale deployments as they grow. Its application acceleration capabilities like SSL Offloading, caching, compression, and connection pooling to ensure faster application delivery of the web application content. Available in five models, the Barracuda Web Application Firewall can be used to securely deploy applications of any size. Standard Deployment Configuration: The Barracuda Web Application Firewall is designed to easily fit into any existing data center environment and to rapidly secure and accelerate new and existing Web applications. Barracuda Networks offers the most flexible array of Barracuda Web Application Firewall deployment options, including both Bridge-path and Route-path. Bridge-path: Bridge-path, the recommended mode of implementation for most customers with existing Web application traffic, enables simple and fast deployment without requiring any IP address changes on either the front- or back-end Web servers or network devices. The bridge is transparent, so no user traffic is disrupted. Route-path: Route-path provides the highest degree of protection for a Web application infrastructure by acting as a full reverse proxy for all Web application traffic. As a reverse proxy, Route-path allows only predefined traffic that adheres to security policies. Additionally, the reverse proxy controls the only route to the back-end network, so traffic cannot flow to any server unless specifically forwarded by the proxy. This is the most flexible deployment mode because it facilitates the content-based traffic management functions of the Barracuda Web Application Firewall. One-Armed Proxy Deployment: Deploying the Barracuda Web Application Firewall in the One-Armed Proxy configuration requires the unit to be set up off a switch only from the WAN port. This configuration creates an additional route for traffic to reach the servers without disturbing the natural flow through the network. Only the traffic that needs to be monitored or secured is routed via the Barracuda Web Application Firewall. One-Armed Proxy as a deployment option is utilized during the initial phases when the administrators want to validate the solution without having to change network settings. Another scenario to use the One-Armed Proxy deployment is to utilize the load balancing feature of the appliance for HTTP/HTTPS traffic, while letting SMTP and other traffic go directly to the server. Fault Tolerant Barracuda Web Application Firewall Environment: Some organizations may need only a single Barracuda Web Application Firewall. When inline in Bridge-path mode, the Barracuda Web Application Firewall’s Ethernet Hard Bypass ensures reliable application delivery. 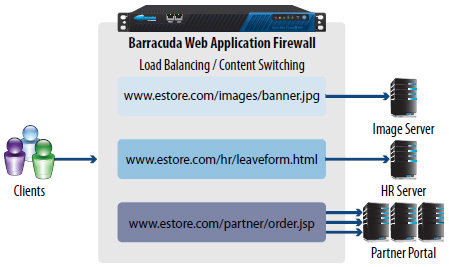 For Web applications with stringent security requirements, the Barracuda Web Application Firewall may be installed in a redundant pair configuration, providing real-time application state replication so that security and user sessions will not be compromised during a failover event. Flexible Deployment: The Barracuda Web Application Firewall offers multiple deployment options for maximum flexibility while ensuring complete security. Built ground up for full reverse proxy deployments, the Barracuda Web Application Firewall insures maximum security and application acceleration in the industry accepted best practice for secure application deployment. In addition to reverse proxy, the appliance can be deployed in one-armed proxy or bridge modes. An inbuilt FIPS 140-2 Level 2 HSM model provides regulatory compliance in the strictest environments. IPv6/IPv4 Capable: The Barracuda Web Applications Firewall is IPv6 ready, offering easy integration into IPv6 or mixed IPv4/IPv6 environments. This gives organizations the flexibility to use the Barracuda Web Application Firewall as an IPv6 gateway while keeping it internal servers on IPv4 until it is ready for full end-to-end IPv6 networks. Comprehensive security: The Barracuda Web Application Firewall provides unparalleled application security to help organizations secure critical web assets. The security capabilities of the Barracuda Web Application Firewall are further augmented by an extensive network of more than 150,000 sensors that are deployed worldwide and feed into Barracuda Labs. The sensors provide valuable data to the security research team to build new security definitions and automatically update Barracuda Web Application Firewalls in the field. Centralized control with Barracuda Control Center: The Barracuda Control Center is the centralized management platform for all Barracuda Networks products. The Barracuda Control Center acts as the centralized policy decision point, while the Barracuda Web Application Firewall acts as the policy enforcement point. The Barracuda Control Center also enables administrators to have an aggregated view of the distributed network via a centralized console. This console can provide aggregated reporting based on data from all of the enforcement endpoints. Input validation: Lack of proper input validation is one of the prime culprits in Layer 7 security vulnerabilities. The Barracuda Web Application Firewall decrypts all encrypted traffic and normalizes inputs to ensure that all data is inspected and validated against known attack patterns before sending to the backend servers. Protocol Validation allows administrators to enforce protocol versions or verbs for HTTP, HTTPS, FTP or FTPS. Cloaking: The Barracuda Web Application Firewall cloaking capability strips out all server related information such as server headers and server banners. Denying information about the server infrastructure restricts the attacker's ability to tune their attacks based on the type of web servers, Operating System, or databases being used. Anti-virus and malware protection: Web applications that allow files to be uploaded can also utilize the built-in anti-virus and anti-malware scanner to ensure that infected files are not uploaded to the web application. Layer 7 DDoS Protection: Distributed Denial of Service attacks (DDoS) attacks have moved to the application layer as they provide higher impact compared to network layer DDoS. Due to its complete visibility into application layer constructs, the Barracuda Web Application Firewall can intelligently fingerprint and throttle these attacks and ensure that the protected web applications continue to service genuine users. Brute Force protection: The Barracuda Web Application Firewall tracks user access to restricted resources and blocks clients if the server does not accept the supplied credentials. Additional rate controlling mechanisms in the Barracuda Web Application Firewall provide additional layer of security against brute force attempts. XML / Web Services protection: Service Oriented Architectures (SOA) with web services is used to build large, distributed and scalable applications. These applications, along with many Web 2.0 based applications, use XML for transferring data between servers and between clients and servers. The XML Firewall built into the Barracuda Web Application Firewall enforces structure on web services and XML data interchange using WSDL and XML Schema provides protection against XML attacks. Data Loss Protection: In addition to inbound content inspection, the Barracuda Web Application Firewall also offers outbound content inspection for Data Loss Prevention. The Barracuda Web Application Firewall prevents data leakage by either masking or blocking responses containing sensitive information such as credit card numbers or any other custom data patterns. Authentication: The Barracuda Web Application Firewall integrates with any user database using LDAP or RADIUS to authenticate a user's credentials before granting access to the secured resources. This allows administrators to add an authentication layer or to offload an existing application authentication policy to the Barracuda Web Application Firewall. Authorization: Authenticated users can be granted different access privileges by applying access control rules. These privileges can be based on a user's accounts or on the group to which the user belongs. Two-factor authentication: Password-based security can be augmented by using client certificates or security tokens. The Barracuda Web Application Firewall integrates with RSA SecurID and client certificates to provide this extended layer of security. Single Sign On (SSO): For a group of applications that need client authentication before granting access, single sign on is used to provide clients with one seamless authentication system, whereby the client logs in once and their identity is propagated to all applications in the group. The Barracuda Web Application Firewall integrates with CA SiteMinder to enable administrators to build a single sign on portal for all of their web applications. The Barracuda Web Application Firewall provides significant capabilities that enable organizations to scale their application deployment infrastructure. Load balancing: The built-in load balancing module distributes incoming traffic across the available servers using one of many available algorithms, such as Weighted Round Robin or Least Connections. Availability of multiple servers is monitored with the help of an integrated application monitoring module. Traffic can be distributed at Layer 4 or at Layer 7. Layer 7 content routing: The Barracuda Web Application Firewall provides enormous flexibility while deploying large applications in which each application module can be deployed on multiple servers. Requested content such as the URL of the module, HTTP Headers and parameters, is used to route content to the correct set of servers. SSL offloading: Web servers hosting HTTPS websites require a significant amount of processing power in handling SSL encryption / decryption. The Barracuda Web Application Firewall provides SSL offloading capabilities, thereby freeing up the processing power of the servers and making them more efficient. Instant SSL: Using the Instant SSL capability of the Barracuda Web Application Firewall, deployment teams can convert their HTTP based applications to HTTPS without having to touch the application code. 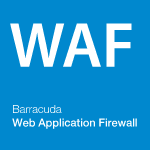 Rate control: The Barracuda Web Application Firewall can control the number of application sessions being created and/or how many times a client can access a given resource. These measures, in conjunction with other rate control techniques such as client queuing, protect web applications from application-level denial of service (DoS) attacks. Caching: The Barracuda Web Application Firewall speeds up application response time by caching static content and using it to respond to repeated requests for the same content. Caching rules can be tuned based on URL space, file size or file type. Compression: The integrated compression engine in the Barracuda Web Application Firewall compresses data as it is sent out to the client. This capability is extremely useful in low bandwidth situations and makes application delivery faster. Protocol tuning: The Barracuda Web Application firewall employs multiple techniques such as connection-pooling and TCP multiplexing to optimize protocol performance. Connection pooling techniques enable Barracuda Web Application Firewall to cut down the overhead associated with creating and terminating connections, thereby cutting the time it takes to respond to client requests. Based on the Linux open source kernel, which has stood up to the scrutiny of security researchers over time, the Barracuda Web Application Firewall operating system is hardened for maximum security and stability. In addition to internal testing, Barracuda Networks credits the "white hat" research community who continually work with security vendors to uncover and resolve potential vulnerabilities in both the Linux operating system and its associated utilities. While the vast majority of Barracuda Web Application Firewall technology is proprietary, Barracuda Networks does leverage secure and functional open source alternatives whenever possible. Barracuda Labs maintains a large network of proxy honey pots to gather information about botnets and emerging web threats worldwide. In addition, customers of other Barracuda Networks products can "opt-in" to report threat data to create a large and distributed data collection network. The data collected from this global network of sensors is applied to tune security policies and also to track and secure against evolving attacks. Starting with baseline security, the Barracuda Web Application Firewall allows administrators to tune the configuration settings at different levels of granularity. The administrators can configure rules that affect the entire application, a section of the application or even a specific URL. These granular rules can be created utilizing the extremely flexible content matching algorithms with an extensive list of security controls. The Barracuda Web Application Firewall's extensive logging and reporting capability empowers administrators and web application teams to tune and secure their web applications. The built in reporting engine provides summarized reports on various aspects of the deployments such as traffic statistics, attack reports and compliance related reports. The logs can be exported out to external logging systems and are completely documented to ease the integration with available SIEM products. The built-in profiling engine continuously evaluates traffic passing through the Barracuda Web Application Firewall. The profiler can create a complete application profile consisting of all URLs, forms and parameters to ensure a comprehensive positive security model. In addition, the Barracuda Web Application Firewall also profiles traffic violations triggered by the configured rule set and uses the heuristics-driven exception profiling engine to create recommendations for tuning the existing rule set. This heuristics-driven model creates a very tight feedback mechanism for tuning security policies. Barracuda Web Application Firewall management tasks can be delegated with rolebased administration. The system ships with multiple built-in roles such as administrator, auditor, network manager and application manager. These roles can be customized or others can be added to meet the requirements of the organization. What does the Barracuda Web Application Firewall do? The Barracuda Web Application Firewall protects your Web site from attackers leveraging protocol or application vulnerabilities to instigate unauthorized access, data theft, denial of service (DoS), or defacement of your Web site. The Barracuda Web Application Firewall provides complete protection of Web applications and is designed to enforce policies for both internal and external data security standards, such as the Payment Card Industry Data Security Standard (PCI DSS). At the same time, the Barracuda Web Application Firewall features a number of traffic management capabilities designed to improve the performance, scalability and manageability of today’s most demanding data center infrastructures. Why do I need a Web Application firewall? Businesses of all sizes that operate their own Web applications should deploy a powerful Web site firewall to protect their Web sites from application vulnerabilities. Traditionally, security has been considered a network issue, where system administrators lock down host computers through a network firewall. While a typical network firewall can help restrict traffic to HTTP and HTTPS, this traffic can contain command exploits leveraging vulnerabilities in the Web application itself. Without the Barracuda Web Site Firewall acting as an application firewall, a hacker’s attack can result in unauthorized access, data leakage, site defacement and/or other attacks that compromise both the privacy and integrity of vital data. What are the major capabilities and benefits of the Barracuda Web Application Firewall? Comprehensive Web Site Protection: The Barracuda Web Application Firewall proxies all Web traffic, providing complete protection in front of your Web sites. Web site protection capabilities include: HTTP protocol compliance, protection against common/high-visibility attacks, protection against attacks based on session state, online form field validation, outbound data theft protection, Web site cloaking, anti-Web crawling and application denial of service (DoS) protection, as well as fine-grain controls. Application Access Control: The Barracuda Web Application Firewall provides PKI support to provide certificate verification and prevents cookie tampering to ensure hidden or read-only form fields are not changed by the user. Application Delivery and Acceleration: In addition to the security and access control benefits of Barracuda Web Application Firewall, there are also additional operational capabilities. Capabilities include SSL offloading, SSL acceleration, load balancing and high availability. Logging, Monitoring and Reporting: The Barracuda Web Application Firewall features advanced capabilities to provide immediate feedback to operations teams that deploy, manage and secure mission critical applications. Besides a system log, Web firewall log, traditional Web log and audit log, the Barracuda Web Application Firewall also provides specific reports relevant to PCI compliance. How does the Barracuda Web Application Firewall detect and mitigate threats? The Barracuda Web Application Firewall provide award-winning protection from all common attacks on Web applications, including SQL injections, cross-site scripting attacks, session tampering and buffer overflows. As a full proxy, the Barracuda Web Application Firewall provides comprehensive inbound and outbound protection. By inspecting request traffic, the Barracuda Web Application Firewall can block inbound attacks and cloak Web sites from hackers, while response traffic inspection prevents sensitive data leakage, such as credit card or Social Security numbers. In addition, the Barracuda Web Application Firewall secures applications from unauthorized user access a full PKI integration for use with client certificates. How does the Barracuda Web Application Firewall protect against Denial of Service attacks? Multiple security capabilities such as Rate Control, Brute Force Protection, Slow Client Attack Prevention and Client IP reputation are integrated into the Barracuda Web Application Firewall to provide protection against Denial of Service attacks. Can the Barracuda Web Application Firewall help my company comply with the Payment Card Industry Data Security Standard (PCI DSS)? Yes, the Barracuda Web Application Firewall assists organizations that store, process and/or transmit credit card numbers to comply with the Payment Card Industry - Data Security Standard (PCI DSS) requirements. As major credit card companies are increasing pressure on merchants to comply with the PCI DSS, many e-commerce businesses are seeking solutions to meet requirement 6.6 of PCI DSS calling for either detailed custom application code reviews or installation of a Web Application Firewall by June 30, 2008. Failure to comply with these security standards may result in fines, restrictions or permanent expulsion from card acceptance programs. Through multiple advanced features, the Barracuda Web Application Firewall can help organizations easily become PCI DSS compliant. Click here for additional information. What logging, monitoring and reporting features are available with the Barracuda Web Application Firewall? Comprehensive logging. The Barracuda Web Application Firewall maintains a rich set of logs on the appliance, including system activity, Web Firewall activity, Web services activity, network firewall activity and traditional Web logs. PCI reports. The Barracuda Web Application Firewall provides a quick snapshot of application attacks defined in the PCI DSS Section 6.5, including unvalidated input, broken access control, cross-site scripting and so on. Will the Barracuda Web Application Firewall fit into my existing network environment? Yes, the Barracuda Web Application Firewall is designed to easily fit into any existing data center environment and to rapidly secure and accelerate new and existing Web applications. Barracuda Networks offers the most flexible array of Barracuda Web Application Firewall deployment options, including both Bridge-path and Route-path. How do I know which Barracuda Web Application Firewall model is best suited to my needs? A regional Barracuda Networks sales representative can evaluate your network environment and Web usage needs to help determine which model(s) is the best fit for your company. What if I have more questions or want to see an online demo of the Web Application Firewall?